After Joseph Smith obtained the gold plates in September 1827, opposition threatened to stop the work of translation. Several attempts were made to steal the plates, and mounting persecution forced Joseph and Emma to move to Harmony, Pennsylvania. 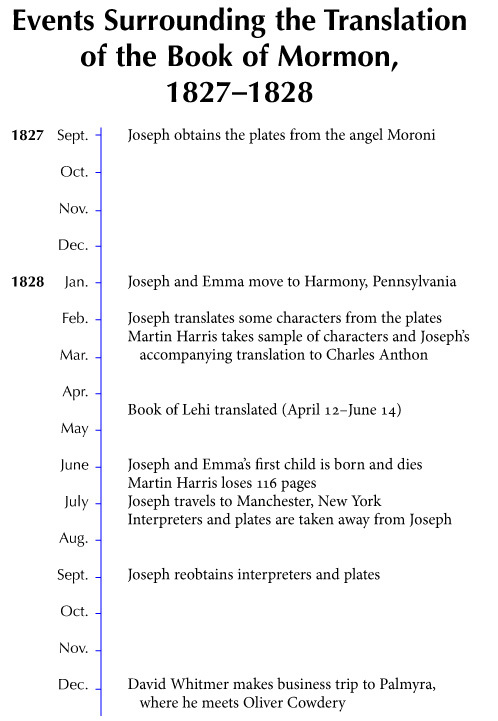 In early 1828, Professor Charles Anthon in New York certified in writing that the characters copied from the plates and Joseph’s translation of them were correct, but he tore up the certificate upon hearing that an angel had told Joseph where the plates lay buried. June 1828 saw the death of Joseph and Emma’s newborn first child. Another setback occurred when Martin Harris lost the 116 pages that Joseph had translated from the book of Lehi and, as a result, the Lord chastened Joseph and suspended his translation privilege for a season. While on a business trip to Palmyra in December 1828, David Whitmer met Oliver Cowdery, who would become Joseph’s chief scribe. Although the years 1827 and 1828 presented obstacles to the translation effort, the stage was being set for Oliver’s arrival in Harmony in April 1829.